I need to replace my inner tie rod (but the manual calls it a "rack". Is this hard to DIY? I just got the outter tie rod replaced and the mechanic didn't say anything about the inner one. Now it needs to be replaced . its not hard and its not called a rack.. its an inner tie rod. the rack is the steering rack. my best advice is get a nice big heavy adjustable wrench and hammer and go get replacement inner tie rods so you know what you are trying to get off. you need to get clear on whether he said to replace the inner tie rod, or the steering rack. is it a problem with leaking? that is the rack. it's a big deal. 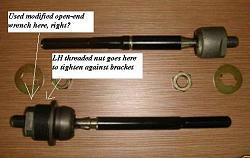 if it is a problem with the links being worn, but not the leaking, it may well be the inner tie rod. 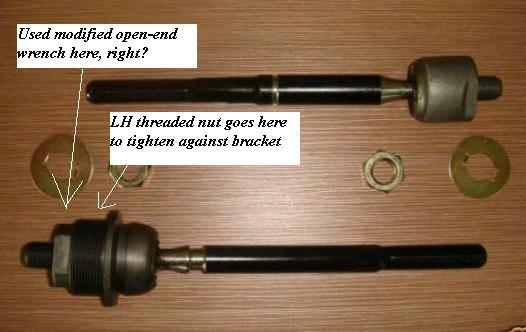 and there are inner tie rods and outer tie rods on both sides, not to mention ball joints and upper control arms. if you are going to do the work, or have it done, thing about replacing all the steering components that are worn. they generally wear out as a set. but don't just start buying parts until you really know what parts need replacing. this is analogous to the "measure twice, cut once" saying. Thank you all for your responses. It's not leaking and the driver side inner tie rod is loose and causing vibration at high speeds. Also had alignment done and had brakes replaced but still vibrating. Any web site(s) on instructions on how to DIY? this picture is not lexus but should do the trick.. this is with the rack boot out of the way too..
the part with the single red circle is where the inner tie rod screws into the rack. ive had best luck with a big adjustable wrench on the boxed part and hit it with a hammer till it breaks loose.. some times they can be really tough. some times they are easy. 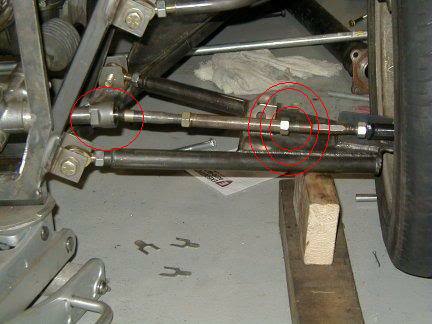 the part with the 3 circles is where the outer tie rod end screws into the inner. there should be a jam nut on there. just break that nut loose and unscrew the inner from the outer. count the number of turns it takes to get out and remember the number. put new inner in in reverse order and thread it back into the outer using the same number of turns... this is just so its close enough to get to the alignment shop. tighten jam nut. thread into rack and tighten.. sometimes i tap it with a hammer to get it as snug as possible. On the single red circle part above, I used a big plumber adjustable pipe wrench since the lip is too small to fit any of my regular wrenches or adjustable wrenches on there. And a good size hammer would do the trick. The rest are pretty simple. I got a quote at Firestones to replace my power steering rack and control arm for $1500. Got it in the garage and jack it up to see it's only the inner tie rod on the driver side, which cost $52 at AutoZone. So, I replaced it and brought it back to Firestone's for an alignment of $79 and now it's running straight. Thanks again for everyone reply and help. Looks pretty easy but just wanted to make sure i wasn't missing anything. Sad thing about it i have to take to same guy already gave it the alignment the first time two weeks ago! it does look easy im sure it is if you have the right tools! I think I took off the outer tie rod first, unbolted the steering damper, and took the whole thing off in one piece including the bracket. I unscrewed it right at the rack shaft after chiseling up that peened over lock washer. yeah im taking the rack out as we speak how does that bracket come off? it seems like it slides off after you take off that big aluminum nut i cant get off haha thanks for the help!!! got to love 2o year old cars post another message if you think of any other helpful hints!!!! Sorry for resurrecting an old thread here, but I think this might help a few people. Jim, thanks very much for your explanation. It helps a lot. 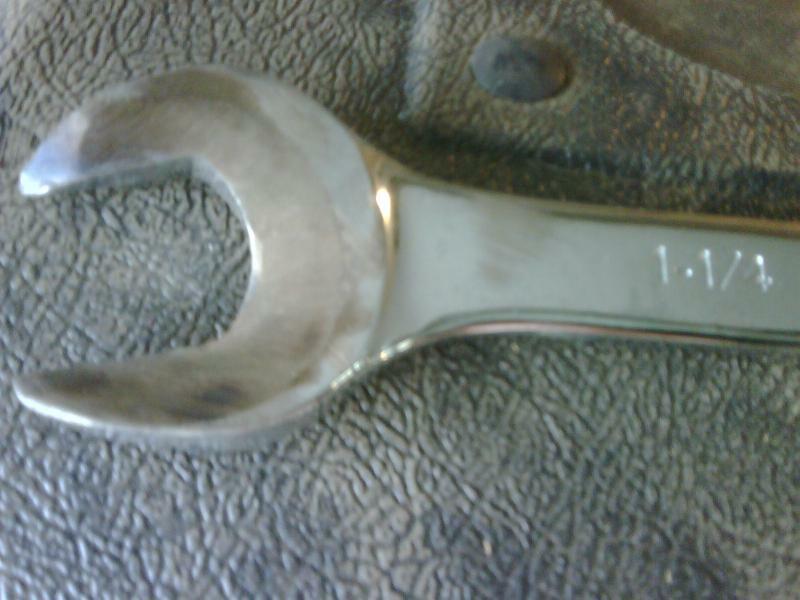 Just one thing - earlier you said that you used a grinder to reduce the size of the 1 1/4 inch open end wrench. I assume then that you used that modified wrench to loosen the entire assembly as one piece, right where I'm pointing at in the picture, right? Did you have any trouble bending the claw washers back when you were done? Nice job. That's correct... You've got it right. I used a hammer and chisel to peen over the new washer afterwards. It came out okay. Here's a pic of my ground down 1 1/4" open end wrench.